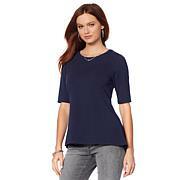 One of the most universally flattering styles, a dolman-sleeve top is every woman's friend. 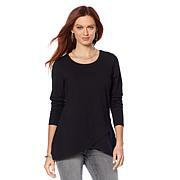 With a loose fit above and a snug fit below, this pullover looks chic whether you are svelte or curvy. The top is quite cute. The material is substantial and has a great stretch to it. The blue color is vibrant just as it appeared online. I just wish I had been able to buy another color but my size was sold out. When I received this in the mail, I thought I was not going to like this top. When I put it on - instant success. I ordered it in the medium. Perfect. This a very high quality fabric. 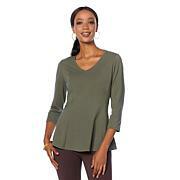 I love love this top, it is very flattering and I love the length. 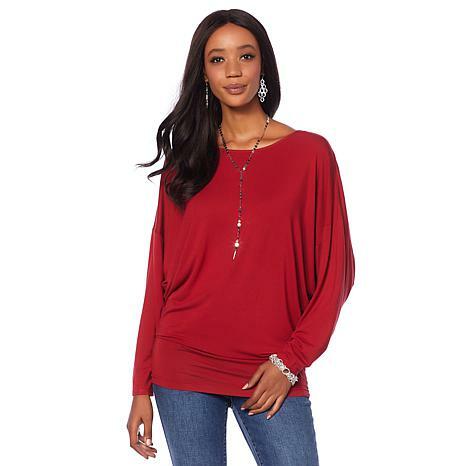 It is so hard to find the perfect dolman. Please bring back the other colors. I will buy them all. Thank you! I just received my top and can't wait to wear it! I'm 5'2" and 115lbs - ordered XS in Black. The material is so soft and luxurious - drapes so beautifully. I realize now what I've been missing :) Ordering the White and possibly the Green too. Please continue making this top - Dolman's are tough to find. I bought this top in black, size. the fabric has a beautiful drape and is figure flattering. It runs large and I would recommend entering your measurements in the size chart before purchasing your normal size. I am buying this in the cranberry also as I love how it looks with my jeans and pants.